Chattanooga's air quality is better, but is it good enough? A group of friends enjoy the view from Rock City on Lookout Mountain. 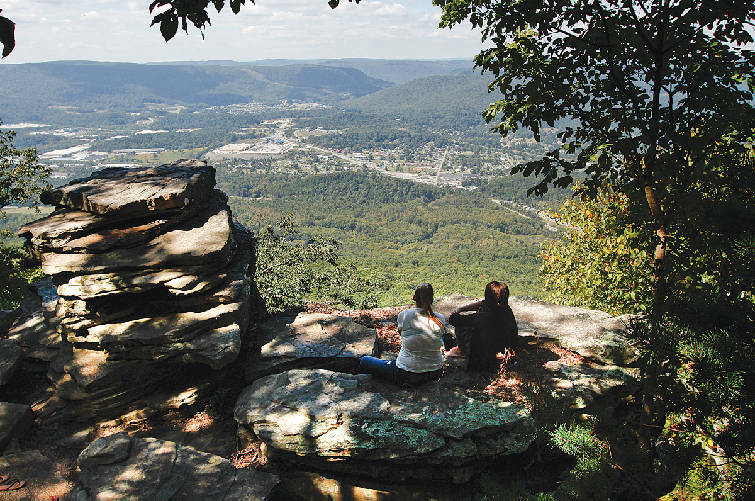 Chattanooga has made measurable strides in the improvement of the area's air quality. According to a Hamilton County Health Department report last week, Chattanooga — a city ranked worst in the nation for air pollution in 1969 — has not had a single day of unhealthy air since 2012. So why did the American Lung Association give the Scenic City a flunking grade of "F" in April for much of that same time period? Friends Stephanie Wright, left, from Kingsville, Mo., and Nicole Gordon, of Ooltewah, Tenn., look out over the Tennessee Valley while visiting Point Park atop Lookout Mountain. The answer depends on who is measuring what and when, according to Bob Colby, director of the Chattanooga-Hamilton County Air Pollution Control Board, which provided data for the health department report. Colby said in an interview Monday that the health department is correct — the city has seen a tremendous improvement in air quality and now meets even the latest, toughest standards adopted this year by the U.S. Environmental Protection Agency. But ozone levels, caused largely by the area's motor vehicles, are still an issue. Colby said that Hamilton County meets EPA standards for healthy ozone levels. But the American Lung Association report gave the city a flunking grade because of 10 days during 2011-2013 when — according to the association's criteria — Chattanooga's ozone levels were high enough to be a threat to people with sensitive lungs. Those people include children, the elderly or those with asthma, chronic bronchitis, emphysema, cardiovascular disease or diabetes. "Improvements are good, but [ozone pollution] is still not at the levels that we would like to see," said Heather Wehrheim, advocacy director for the American Lung Association of Tennessee. "Sometimes with our methodology, the rating comes out more stringent." The lung association pointed out that Chattanooga had made dramatic progress with the other major type of pollution, particles, or soot. "Chattanooga is ranked one of the cleanest cities with no short-term unhealthy particle days," the report said. "Compared to the 2014 report, Chattanooga has cut year-round particle pollution [soot] levels significantly." The Chattanooga data used in the lung association report did not include numbers for 2014 and 2015, when the Air Quality Board said there were no unhealthy days. Ozone remains an issue nationwide, with more than four out of every 10 Americans living in areas with unhealthy levels of ozone, according to the lung association. For Chattanooga, the reduced pollution levels are a huge improvement from 1969, Colby said. 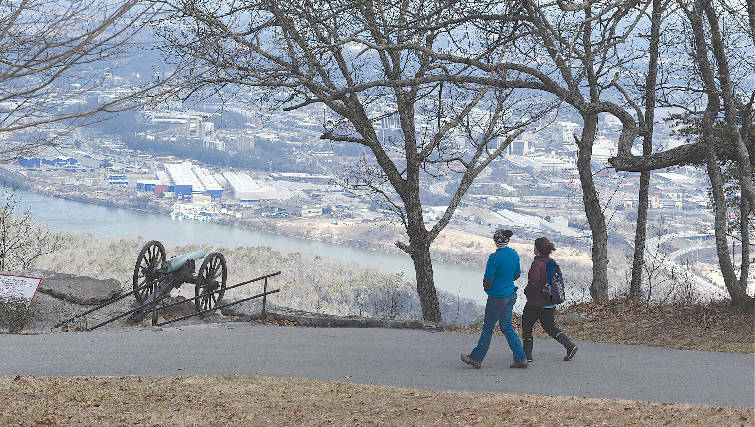 In those days, residents of Lookout Mountain or Signal Mountain often could look out and see a brown layer of smog hovering over the downtown area — a thermal inversion held in place by the mountains and Missionary Ridge. Several large manufacturing facilities off South Broad Street spewed particles into the air, and local residents often complained that a shirt that was white in the morning would have a layer of black soot around the collar by late afternoon. The Southern Saddlery leather tanning operation on South Broad added its own peculiar tang to the air. Most of the polluting factories are either closed or have cleaned up their facilities, Colby said. Coal is no longer used to power most industrial processes — the Tennessee Valley Authority closed its last nearby coal-fired generating plant (Widows Creek, 35 miles away in Alabama) at the end of October. But the ozone problem remains, and there is not a lot Colby or other local environmental regulators can do about it. The good news is that Chattanooga meets federal standards. "We do meet the ambient air quality standards for ozone and have been meeting them since 2008," Colby said. "And EPA just announced a new standard for ozone, 70 parts per billion, and we currently meet that." Ashley Sloane, left, and Jade Scott walk along a path at Point Park on Lookout Mountain. Since 1979, there have been six years of extremes when the ozone level was high enough to be unhealthy for what the EPA calls "sensitive groups" for more than 20 days out of the year. The worst years were 1998, with a whopping 29 days of ozone issues, and 1988 with 26 days. But since 2002, the number of days has remained in single digits, and for the past three years, there have been none at all. Lowering the ozone levels further is now largely in the hands of federal officials, Colby said. Vehicle emissions standards are set nationally, by the EPA, and the rules allow existing equipment to be used until it wears out. That can be a long time in the case of large diesel-driven earth-moving machines, trains or marine vessels. "We see vehicles operating around here now that were in service during World War II," Colby said. "With trains and marine vessels, it takes a long time to implement these standards." Auto emission standards are slowly improving, but at least a portion of Chattanooga's ozone pollution drifts northward from Atlanta, he said. "We had one study that showed that 20 percent of our ozone pollution is coming in from the Atlanta area," Colby said. "I don't know how to fix Atlanta."